What happens when Salman Rushdie comes out with a brand new book? There’s a party, yaar! *Shalimar the Clown* is Rushdie’s new novel and it’s received mixed reviews, but the grand party thrown for the novelist at the Asia Society, was pure, unadulterated joy for diehard people watchers. The wine flowed and the menu included gourmet dishes, from spicy Goan shrimp curry to freshly made mithai. Salman Rushdie loves gulab jamun, so it was brought out especially for him – and he tucked right in. The guest list was a veritable who’s who of movers and shakers. Why, there was Anita Desai and her daughter Kiran Desai! Two authors for the price of one! And wasn’t that Shashi Tharoor over there? Turn around, and there was publishing icon Sonny Mehta and his wife, author Gita Mehta. Even actress Lisa Ray! 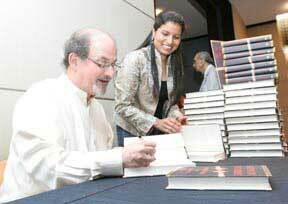 The tongue-in-cheek, the droll, the mischief making Rushdie one often espies in the writing was very much present. As the audience gathered close, reverentially hushed to hear the master expound on his new book, he announced, his eyes laughing, that he was going to read them “all the dirty parts.” And he proceeded to do so, animating the taken aback audience into surprised chuckles.